So use one of those moments to enjoy this fresh take on Dresden Plate designs by the mother/daughter duo Marian B Gallian and Yvette Marie Jones. The sewing lineage in their family runs deep, with Marian’s mom sewing clothing for her children as they grew. And Yvette has kept the thread flowing, too. Marian is also owner of Pink Hippo Quilts, a pattern design company, and Yvette’s pattern design company, Vetmari, offers quilts with a more modern aesthetic. And we’re thrilled to bring them into our q-niverse. GenQ: What are your top 5 favorite quilting foods? Yvette: I would have to go with chocolate, Ritz crackers with cheese, grapes and more chocolate. Yvette: I love designing with orange and tend to gravitate toward either a bright palette of happy colors or a soft and serene palette of blush pinks, teals and grays. 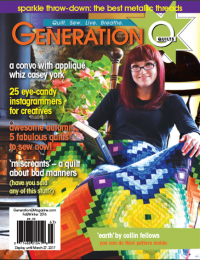 GenQ: Three things you want quilters to know about quilting? 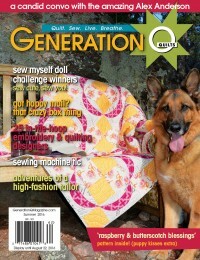 Yvette: 1) Don’t be intimidated to try a quilt that looks difficult. 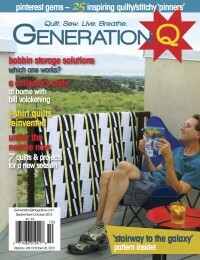 When you break most quilts down, they are simpler than you think! 2) There’s an easier and faster way to do everything, keep learning new techniques and experiment with your own. 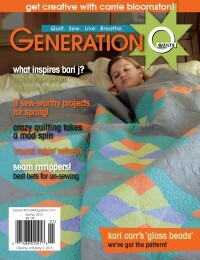 3) Use those quilts! In using them, they become even more special because they hold a place in your memories and not just on your shelf. Marian: 1. Relax and enjoy the process. Quilting should be fun. 2. Avoid deadlines if possible. 3. Work on several projects at once so you will have variety. 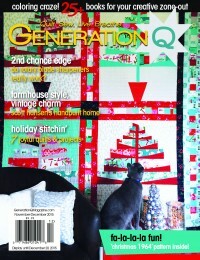 GenQ: Favorite beverage in while you’re piecing or quilting? Yvette: I have to say I’m pretty boring when it comes to beverages. I’m a water girl and I don’t drink much else. When I do drink soda, root beer and cream soda are my faves and I can always go for some hot chocolate. 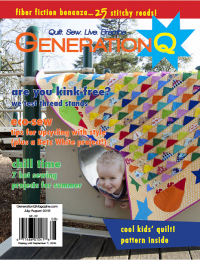 Gen Q: Quilting influences (people, fabric lines, something in nature…)? Yvette: I love to take inspiration from the past and put a modern spin on it. The Art Deco era is my favorite to draw from and I’m also very drawn to antique Baltimore album quilts. Marian: I collect pictures of color palettes I love. I like to recreate or modernize antique quilt patterns. Thanks, Yvette and Marian, for playing along on our question game. And thanks for the opportunity to give away a copy of Dresden Carnival (US winner: printed copy; International: digital) to a lucky reader. In the comments to this blog post, let us know the beverage you allow in your sewing room or sewing space. We’ll choose a winner Wednesday April 27. Congratulations Janet T, comment #33! Please check your email! I only allow water in my sewing room. My mom ( a seamstress) taught me that a looong time ago when I filled her coffee mug to the rim and spilled coffee on her sewing machine. I was suppose to put the coffee on the ledge by the door. HI, I allow whatever I’m drinking in my sewing area; I’m very careful with it. However I have upset my drink in my keyboard>LOL! Thanks for the great book giveaway! I drink tea and coffee but they have to be in their special spot on a coaster…too many bad things happen when you spill coffee…although stains can be creative! I don’t have a lot of table space in my sewing area (at least not a lot of space that isn’t covered by fabric) so I usually don’t have a drink in there, but my coffee is just outside the doorway for when I need it! All beverages welcome in the sewing room! Adds to the “happiest place on earth” motto that’s strictly followed in my sewing room. A cup of tea is always welcome in my sewing space. Hot chocolate and the occasional glass of wine. I’m a risk-taker. I have my coffee or tea back here in my quilt room … but keep it away from my goodies. nice book! thanx for the opportunity to win a copy. I drink soda, carbonated water and juice in my sewing studio. I figure if it’s me, I drink hot tea. My Grandsons can’t bring anything in. My daughter whatever she wants. My husband just peaks in the room for the most part. I too am a simple water gal. I keep a glass of water handy. This book looks amazing! I allow Crystal Light Peach Tea in a cup w/a cover & straw of course! Coffee or sweet tea, only me and I do not put it near my fabric or machine. I never take my drink of choice – Diet Dr. Pepper. I’m sure I’d lose it in the piles of fabric. I know I take chances, but I drink what I want in my sewing room. I figure I can get most things out of clothing when I wash it, cotton is washable, so why not enjoy myself? I allow myself coffee or diet coke (I know I shouldn’t ), I use sealed cups (teva? ), to prevent spills. I wish a had a cup holder! Black coffee is the only beverage that come into my workroom! I love all of the fresh fabrics that are used in the book. I only take water into my sewing area, and that is to fill my iron with. While creating, I try to slip in breaks from time to time, ergonomics. 🙂 Thank you for sharing. I drink mostly water when sewing but occasionally a diet soda makes an appearance. I can drink anything in my sewing room, but most often I don’t bring any beverages with me. I actually had a glass of red wine there a couple of weeks ago! Hot Tea in the morning and Ice Tea the rest of the day! Both Hot and Cold Teas and Hot Coffee are the main drinks while a quilting friend and I create quilts together for gifts and Project Linus, because we sew at the kitchen table. 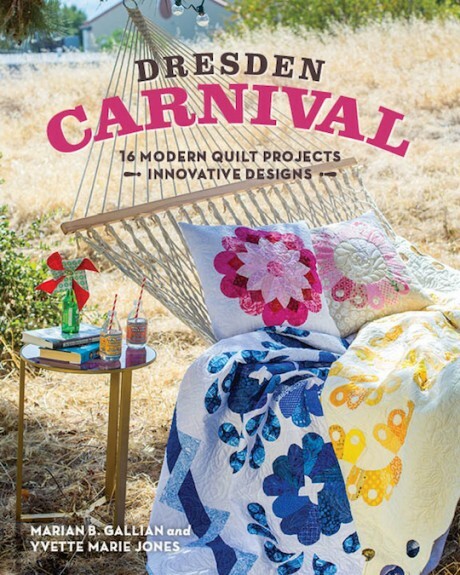 How exciting for a chance to win this amazing book, I have always loved Dresdens! ; Thank you for this opportunity! My sewing area is off the kitchen, so I take a quick break if I want something. If I have liquid near, I WILL spill it! Coffee is usually in my sewing room! Thanks for the opportunity to win! I take water & ice tea which is on the side table in my sewing room. Water usually, but coffee in the morning in my no-spill mug. Occasionally, a glass of wine- especially when at a retreat! Iced or hot tea or water. But it never sits next to the sewing machine because that would be disastrous if I had an accident. Our house rule is that drinks are only allowed in the kitchen or dining room. The only exception is water. That’s worked well for us and the kids. I usually have either water or tea…try to avoid anything else! Thanks for sharing the giveaway. Whatever is in my hand at the time. When my husband brings me a hot cup of tea he has learned (the hard way) not to put it on the cutting board. I have been the guilty party in spilling a glass of wine onto the keyboard of my laptop (such a waste of wine!). Pretty much no-one else but the dog comes into my sewing room – they know better! Anything goes, I just keep it away from my project. I drink what I want mostly tea,coffee or water in my sewing room. I figure if I spill I can get it out or if not just tea dye the project! My worst mistakes are usually snipping something with a pair of scissors that I shouldn’t. I drink hot tea. I find it calming and puts me in the right mood to sew. I quilt better when there is a cold Coke in my sewing room. I’m careful about spills, but I would be making more mistakes without that Coke–and without a rotary cutter around, there are more dangerous mistakes than a spilled Coke. Like Janie in the previous post, I only take water into my sewing room for my iron. The trip down and up the stairs and the few minutes it takes to sip a cup of tea are good breaks to stretch and energize. Water only! But as far away from the sewing machine and cutting board as possible. Spilling your pins is bad luck (or so we say around here) but spilling anything over your fabric is no fun at all! I do like coffee till the pot is empty but I keep it away from my machine. I also have water and occasionally root beer. Thank you for the chance to win. I would love to learn. Anything goes, but usually coffee hot or iced. It has to go in a certain spot though on a coaster. I drink tea, coffee and water in my sewing room, but I leave it on a desk away from sewing machine, cutting board and fabric. I only have water in my sewing room. My machine shakes the table a lot and at least water will wash out. Water is the only thing I drink in my sewing room. Thanks for the chance to win a copy of the book. I mainly only allow water in my sewing room but have been known to sneak a cup of hot or iced tea sometimes. Thanks for the great giveaway. I seem to always have tea in my special sealed lid tea thermos but then I usually get too busy to drink it! IF I bring something to drink in my sewing room it is iced tea when it is warm or hot tea when it is cool. But it has a special spot far away from all my material. LOL I know me. I tend to be clumsy when I am concentrating on sewing. Tea–if it spills, I can do an all over tea dye!